Sonography is an expensive option for a veterinary practice, but it comes with a steep learning curve few are prepared for. 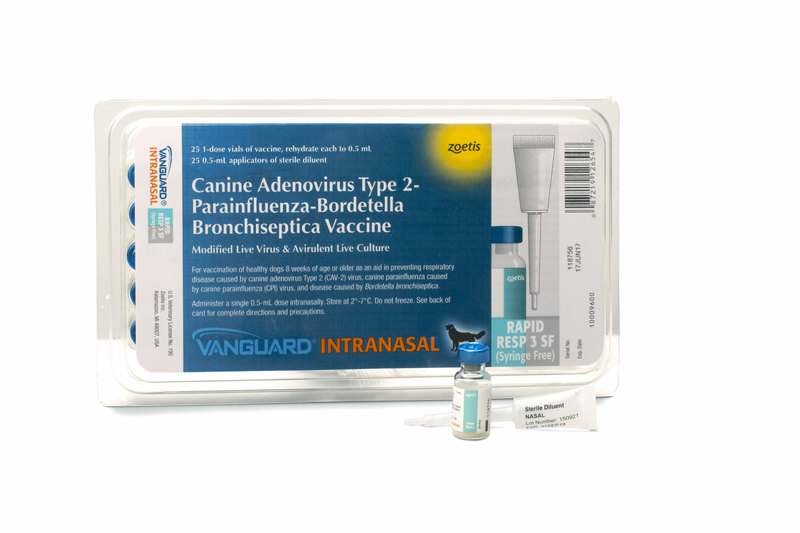 Franz, 13-year-Old MN Miniature Schnauzer with pancreatic necrosis and pancreatic abscess. The Power Doppler (orange) shows blood flow to the portal vein (bottom left) but not to the hypoechoic tissue which would most likely indicate necrosis. There is an abscess (large arrow) that was subsequently drained by US-guided procedure. The smaller arrows indicate reactive hyperechoic fat around the necrosis and inflammation. Ultrasound services aren’t necessarily reserved for high-volume practices, experts say. 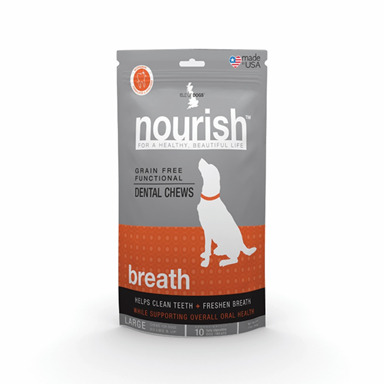 Although many veterinarians determine that their client bases might not validate the expense, some sonographers work independently and will travel to a veterinarian’s office. Depending on the quality, a new ultrasound machine can cost from $10,000 to $100,000, but the price tag isn’t the only potential obstacle. A veterinarian sometimes invests in the equipment but is unprepared for the learning curve. Some say that even seasoned practitioners need a year to feel comfortable interpreting ultrasound images. Bear, 14-year-old MN Siamese cat with a spontaneous diaphragmatic hernia. The anechoic gall bladder (left) and spleen (near field top) residing with the heart (bottom right) within the thorax. Dr. Rowe offers her ultrasound services to practitioners and brings the equipment. A practice’s treatment options are limited if it doesn’t have ultrasound equipment and doesn’t utilize freelance sonographer services, she says. 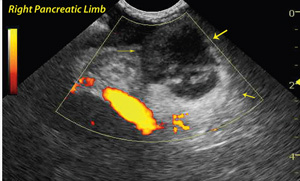 The most common use for ultrasound is investigating abdominal and cardiac issues, according to Rowe, but the possibilities of ultrasound are vast–determining the cause of a heart murmur or soft tissue problem and investigating masses and tumors, chronic urinary tract issues, ophthalmic issues and muscular-skeletal problems. Buster, 11-year-old MN Labrador Retriever had a sonogram prescribed for evaluation for elevated liver enzymes. 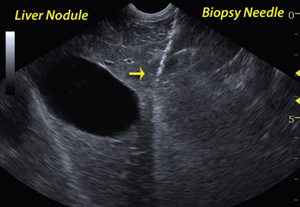 A nodule (arrow) was discovered in the left medial lobe that underwent an ultrasound-guided core biopsy procedure from a left intercostal approach. Dx: Hepatic nodular hyperplasia and inflammatory hepatopathy. Though technology is making ultrasound images clearer, the image interpretation and preliminary case information must come together to help form a conclusion. 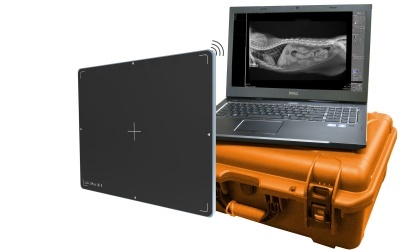 Manufacturers often include education in the cost of new equipment, but some veterinary sonographers say the training only scratches the surface of what is necessary. Kirby: 3-year-old Miniature Schnauzer that was presented for lethargy and “star gazing.” Bile acids were moderately elevated. 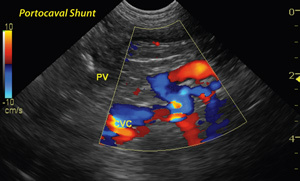 The color flow demonstrates an extrahepatic portosystemic shunt (splenocaval shunt). 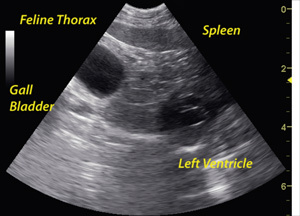 The vertical deviation of the vessel represents the actual shunt located at the entry of the splenic vein into the portal vein (pv) but is deviated dorsally (toward the bottom of the screen) into the vena cava (cvc). The patient responded well to ameroid constrictor placement at a surgical referral facility. Ultrasound operators must be able to recognize a slice or cross section of an organ and determine if it appears healthy, damaged or diseased. 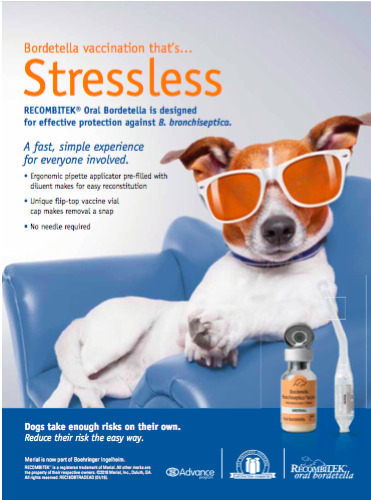 Once the trade is mastered, experts say, veterinarians are amazed at what they can accomplish without surgery. “The bar is being set higher all the time with new techniques and interpretations of theory as well as improved technology both from an imaging standpoint and work flow enhancements,” says Eric Lindquist, DMV, Dipl. ABVP, president-elect of the International Veterinary Ultrasound Society. “The learning curve is a function of the practitioner’s expectations,” Dr. Lindquist says. “The curve never stops. It may take a year to reach the goal of basic ultrasound, but it may take a lifetime or potentially never happen at all. “If image capture is the goal, then this is the first step of the project and the concentration should be focused first and foremost on just obtaining the images at the highest level possible. Then the interpretation of the images really never ends because image quality is always getting better. Combining the image presentation with the clinical information at hand is another art in itself. The techniques of using ultrasound vary depending on the animal’s skin type, the patient’s health, whether the operator is scanning through hair, and whether the animal is being held and is cooperating. Practices can acquire used ultrasound equipment, but manufacturers say buying an aged piece is unwise considering the speed at which the technology is advancing. 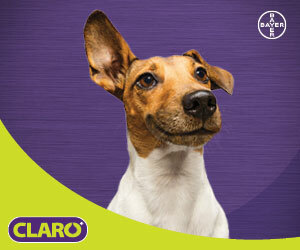 Before buying an ultrasound machine, a veterinarian needs to determine how he plans to use it. The higher the resolution, the easier the image will be to decipher. Today, 3-D and 4-D machines are available. In addition to determining the intended use of an ultrasound machine, the return on investment (ROI) needs to be computed. As with any equipment purchase, one ultrasound machine may have more bells and whistles than another machin. When buying an ultrasound machine for the first time, Lindquist suggests consulting with someone. “Go with what you know and trust and have an advocate,” Lindquist says. “An ultrasound advocate is just like when someone is sick they should have a medical advocate. And you can certainly get sick trying to figure out which machine to buy and how many bells and whistles you really need for the next three to four years of your learning curve. Start with a solid ultrasound name that you can identify with because they will be there year in and year out in all likelihood. Among the advances in ultrasound are iScan image optimization, says Randy Laufersky, president of Core Ultrasound of Comstock Park, Mich.
Lindquist says starter machines typically cost $30,000 to $60,000. The technology in this price range should last about three to six years before market pressures call for an upgrade. “Once you have narrowed it down to two or three machines, choose the one your eye and work flow best identify with,” Lindquist says. “You don’t want your eyes and brain to get tired trying to figure out what you are looking at most of the time, and you certainly don’t want to lose time on complicated knob-ology.